Suitable for most cotton, cotton-polyester, wool, lycra and other basic fabrics. 330°F - 335°F Medium to firm, even pressure. Peel WARM. For NEONS. and COLUMBIA BLUE Peel COLD. TEFLON for 2 seconds. Wash warm tumble dry normal.Suitable for dry-cleaning. *NO NYLON. Be advised that DYE MIGRATION has occurred with low energy dyes in polyester and poly-blended fabrics. * INSTRUCTIONS FOR APPLICATION to moisture-wicking materials: Damp a cloth with rubbing alcohol (Isopropyl alcohol), then rub it into the area on the garmet you want to apply your design. Allow it to dry and apply your material. This will allow better adhesion to the garmet. * INSTRUCTIONS FOR APPLICATION TO DAZZLE CLOTH & SHINY POLYESTER FABRICS: We highly reccomend that you TEST prior to doing large runs. 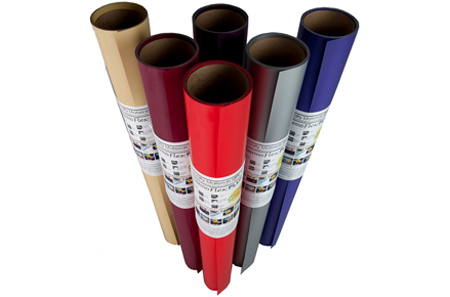 Coated Polyester can routinely cause adhession issues. NOTE: Take care when layering media - SOME colors should NOT be layered beneith or below some colors.